Respirator masks have historically been designed with lots of silicone rubber to slop over a range of faces. This works adequately for many facial sizes but not for all. For face profiles that don’t follow the norm, the use of respirators can lead to a false sense of security due to air leakage or a contamination threat. The National Institute of Science and Technology has been engaged in a multi-year program to improve the safety and effectiveness of full-face respirator masks. 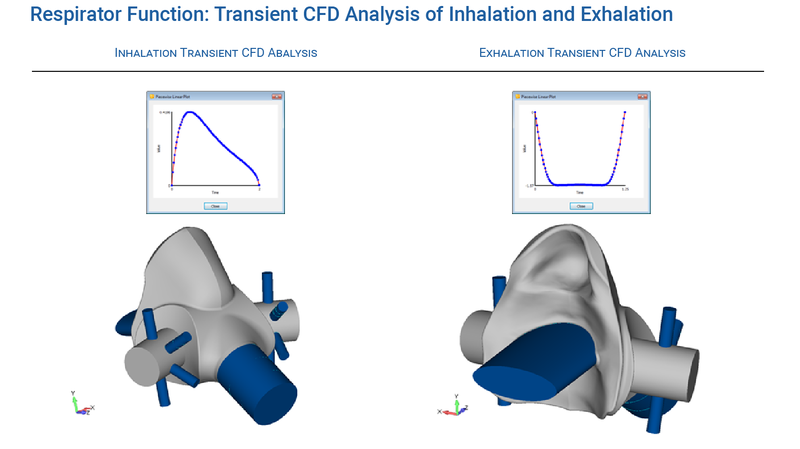 To meet some impending deadlines on this project, Predictive Engineering was competitively awarded this FEA and CFD consulting project to study the fit and function of an industry standard respirator mask. A key finding of this work was that the modeling of human skin is best represented as a flexible bag of viscous fluid and not as a semi-elastic solid as has been done in prior work external to NIST. The transient, dynamic CFD flow studies also indicated that air flow within the respirator mask is not optimized and could be improved with some minor geometric changes. The project involved the complete dynamic analysis of the fitting process between a respirator mask and a human head. The respirator seal geometry was provided as IGES data generated from laser scanning process over the original respirator. Head geometry was likewise provided in a similar format. Femap (Siemens PLM Software) was able to parse the skins together and create a clean manifold skin that facilitated a quad-dominate mesh for the respirator and likewise a smooth tet mesh for the head. This model was then meshed and analyzed using LS-DYNA. The material model for the silicone seal material was simulated using *MAT_181 Simplified Rubber based on uniaxial force deflection data provided by the client. The human skin model was based on data provided by NIST and other sources from the literature. The material model for human skin was likewise based *MAT_181 but with much stiffer properties. The simulation was initiated by pulling on the straps to secure the respirator mask against the face. Seal pressures were then calculated over the skin of our head model. The LS-DYNA analysis accurately captured the silicon rubber seal behavior as it molded against the softer skin of the FEA head model. An optimization study using different strap tensions quantitatively demonstrated the importance of correct mask fitting to ensure a leak-free fit around the face. For functional analysis, a transient CFD analysis was performed by our CFD consulting services group. 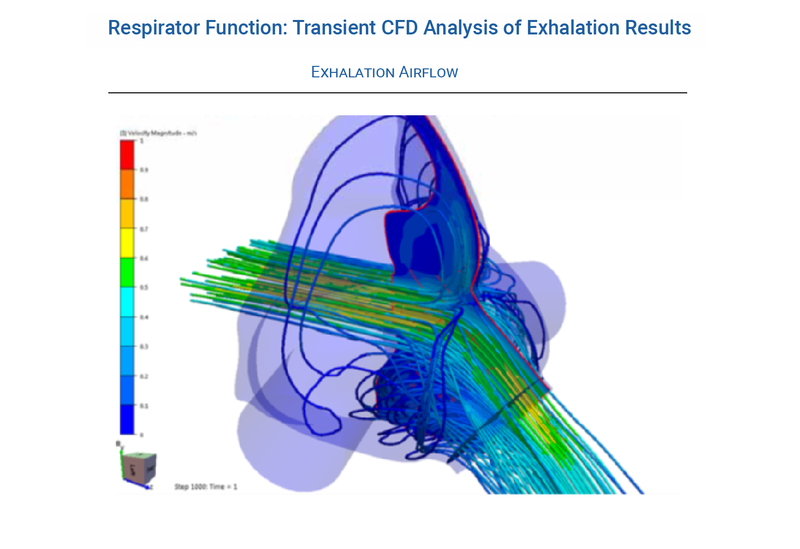 Transient flow patterns were simulated for inhalation and exhalation. Flow resistance was measured during these transient respiration flows to determine where the choke points were within the respirator mask flow path. Particle tracing also showed that the air flow path is not well optimized in the standard respirator mask and with some minor geometry changes the pressure drop or breathing effort could be improved. If you think we could help your team with a CFD consulting project, please contact us and we would be happy to discuss project particulars and maybe suggest some ideas where you might not need to hire a consultant to solve a flow or thermal challenge! Figure 1: One can imagine that a loose fitting mask is actually more dangerous than no mask at all. 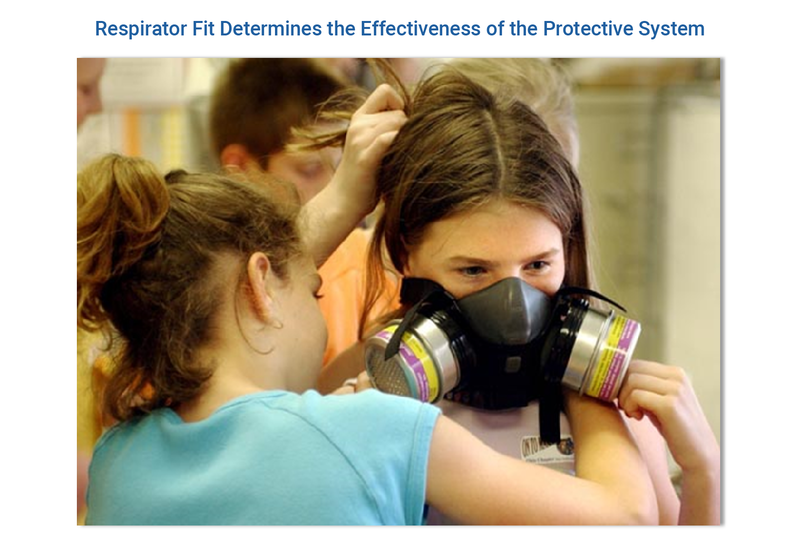 Mask fit is something of a dirty secret in the respirator business since many non-standard facial sizes (e.g., young children) are problematic to obtain air-tight seals without pulling so hard on the straps that severe discomfort quickly incurs. The same constitutive model for the silicone rubber and human skin (*MAT_SIMPLIFIED_RUBBER) was used, albeit with different properties. If this sort of work interests you, please take a look at our LS-DYNA Consulting Services site. The simulation provided quantitative information over the relationship between strap tension and sealing performance against our head model. These results were validated against known mask performance and shown to correlate well. Figure 4: Using the original respirator and head geometry, an interior volume was created. The geometry was slightly modified to account for the different flow path requirements for inhalation and exhalation. In CFD analysis, boundary conditions can skew the results due to enforced conditions that don’t naturally exist in the real system. Based on prior CFD consulting projects, we sized the boundary geometry to ensure smooth and continuous flow conditions prior to entering the respirator mask flow regions of interest. The particle tracing clearly shows how the mask’s internal geometry tends to create unnecessary turbulence as air is drawn through the filters and into the mouth. The images above show the flow patterns at 0.75 seconds into the inhalation process. The exhalation process is direct out of the mask through the front filter. Air flow results indicate that the mask is optimized for exhalation or one could say – there is just not much more you could do to improve the flow pattern.